Inspired by his travel in Italy, Yves captured the essence and inspiration of the great Italian masters. 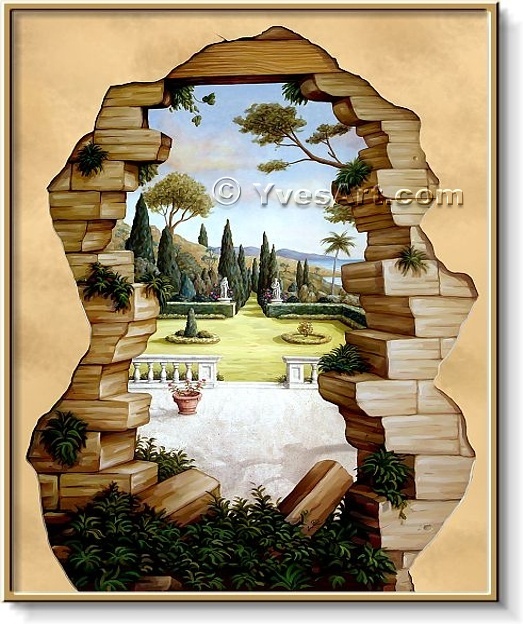 In this piece "The Other Side", Yves wanted to open a confined corridor facing a doorway, entrance to master bathroom. By placing this Mural it made the corridor more open and also created an escape for your eyes to wonder in this magical Riviera garden. This mural scene is an hand painted original 6' x 8' custom designed by Yves and painted directly on the wall.